There are times when you need to have your phone or tablet with you but there are also times when it is better to leave your phone in your bag or even at home. If the mere thought of this makes you break out in a sweat then you can check yes to this one! We have all done this when waiting for an important text or update, constantly ‘waking’ the phone even though you know that you would have seen the screen light up if a notification had come through. This behaviour can become obsessive – if you recognise yourself here, check yes! Do you feel withdrawal-style anxiety when separated from your phone or other device for even a short period of time? Getting away from technology for a few hours should be liberating, not stress-inducing. If the effect on you is more the latter then you can answer yes to this one. Have you regularly spent hours on on your device without actually doing anything you can quantify or even sometimes remember? Technology addicts often use various devices at once, going between various tasks but not really concentrating on any one thing in particular. Is your phone the first thing you reach for when you wake? Do you always check your phone last thing at night and first thing in the morning? If this sounds like you then you are a yes! What is your biggest technology addiction giveaway? If we get some good ones here we might do a new list and a new cartoon! yes to all 5 above! Yikes! 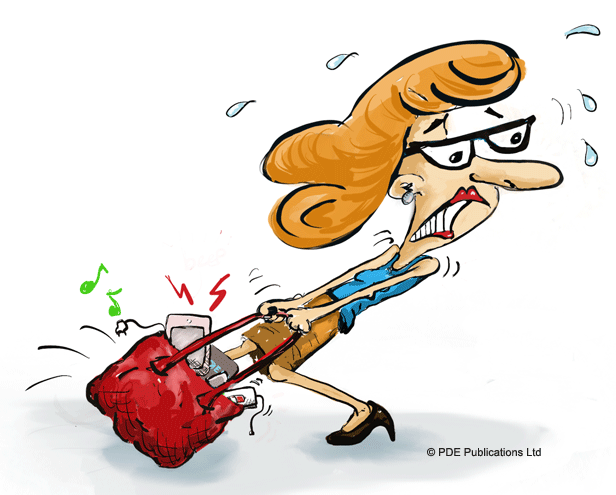 I actually hear my phone ringing in my bag when it is not even ringing – regularly!! !